This supernatural mystery set in the world of Sherlock Holmes and Lovecraft's Cthulhu Mythos features a brilliant detective and his partner as they try to solve a horrific murder. The complex investigation takes the Baker Street investigators from the slums of Whitechapel all the way to the Queen's Palace as they attempt to find the answers to this bizarre murder of cosmic horror! 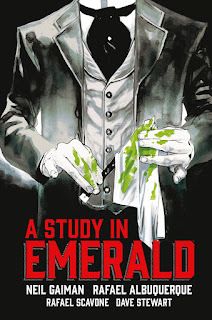 From the Hugo, Bram Stoker, Locus, World Fantasy, Nebula award-winning, and New York Times bestselling writer Neil Gaiman comes this graphic novel adaptation with art by Eisner award winning artist Rafael Albuquerque! The latest in Dark Horse Comic's Neil Gaiman Library series, A Study in Emerald adapts the short story of the same name from the short story collection Fragile Things. As with all the Dark Horse adaptations, this has its strong and weak points, but does a more than admiral job of capturing the essence of the story. Without giving much away, this is obviously a pastiche of Sherlock Holmes with Lovecraft's Cthulhu universe and takes A Study in Scarlet as its inspiration, but also contains an unexpected twist at the end. It has been awhile since I read the original short story, but I feel that they gave away some of the mystery to the story a little too early. I remember a real feeling of surprise when I figured out how everything was coming together and yes, that may have influenced me, but I don't think that someone reading this version will have that same experience as all the pieces of the puzzle start coming together. Or maybe I'm just remembering this wrong and the original did give more away earlier on in the story. Either way, this is a great volume unto itself, but I recommend reading the original as well.